Stretching from Deptford in the north to Croydon in the south, the Great North Wood was once a vast tract of woodland and wooded commons. The wood was largely managed through coppicing — an ancient sustainable way of harvesting wood — which allowed it to thrive for centuries. As the industrial revolution transformed traditional woodland industries the value of woodland lessened, paving the way for destruction and urbanisation. Today, the Great North Wood lives on in isolated fragments of woodland scattered across its original footprint. Key sites include Sydenham Hill Wood, Dulwich Woods, One Tree Hill, Beaulieu Heights and Long Lane Wood. The ancient character of these woods is revealed by the presence of plants such as wood anemone, bluebell and Solomon’s seal. The Great North Wood continues to support a rich fauna with rare insects such as the fearsome-looking stag beetle which spends up to seven years burrowing through deadwood as a larva before emerging as a splendid antlered adult. The great spotted woodpecker, whose distinctive drumming can be heard ringing out through woodland in spring, is another successful inhabitant of the Great North Wood. Unfortunately, a lack of management in some of these woodlands has led to critical threats to wildlife and to their continued existence. Amongst these threats are erosion and trampling, encroachment by invasive plant species, fly-tipping and vandalism. London Wildlife Trust’s new Heritage Lottery funded project: The Great North Wood will seek to address these threats by enlisting local people in activities to manage woodland for wildlife. 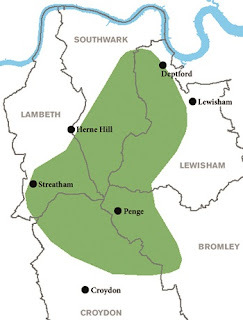 Working alongside the five borough councils which the project area encompasses will be the Forestry Commission, the Greater London Authority and numerous Friends groups and community groups. Working together with these groups the project aims to make significant improvements to south London’s woodland environment over the lifespan of the project and beyond. An extensive programme of community engagement events will allow a diverse audience to learn about and experience the woodland and remind people about the largely forgotten landscape of the Great North Wood. Shame that London Wildlife Trust has rubber stamped Southwark Council's destruction of woodland in both Camberwell Old and New cemeteries, all in pursuit of an unsustainable burial policy. Just because woodland is outside of a nature reserve does not make it less valuable!